This flavorful bread is the perfect addition to any meal. Cut the dinner rolls in fourths or the Texas Rolls in sixths. Dip 16 of the roll pieces in butter and layer in the bottom of a sprayed loaf pan. 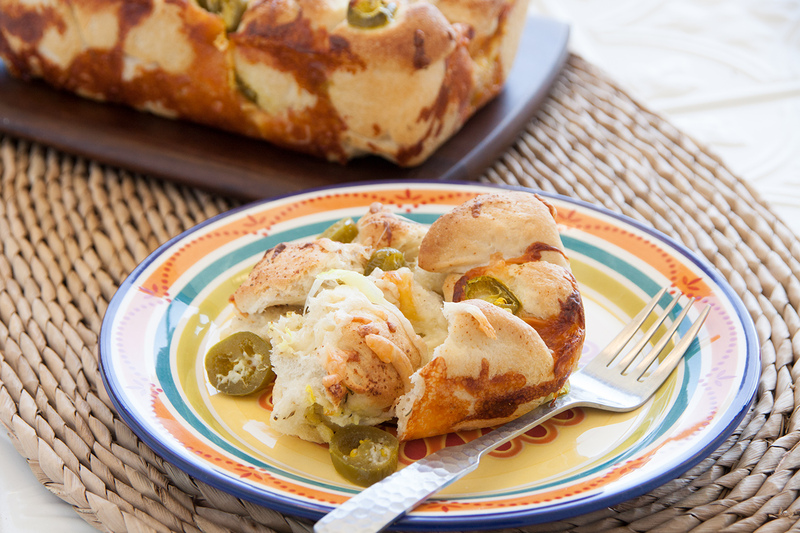 Sprinkle dough with 1/2 cup cheese, 1/4 cup jalapeno slices, 1/4 teaspoon oregano and 1/4 teaspoon garlic powder. Dip 16 more pieces in butter, layer over first layer and sprinkle as before. Dip the last 16 pieces, layer and sprinkle as above but leave the cheese off. Cover with sprayed plastic wrap and let rise until double. Bake at 350 degrees F 20 minutes. Remove from oven and sprinkle with remaining 1/2 cup cheese. Bake 5 minutes longer until cheese is melted. Remove from pan to cool and serve warm.